Expiry day saw Nifty scale new highs for the series and also for the year with the index adding 97.55 points to shut shop at 5825. It was a one way trading with the index gaining in strength with each passing hour with no correction at all in-between. Nifty added huge 72.2 lacs in Open Interest. The broader market was positive but not in sync with Nifty with 891 advances to 638 declines. The December series OI Table saw huge addition at 5900-6100CE and 5800-5700PE levels with initial range of 5700-6000. Call option 5900-6300 added 54.44 lacs huge amount of OI with some short covering seen at 5700 and below strike prices. 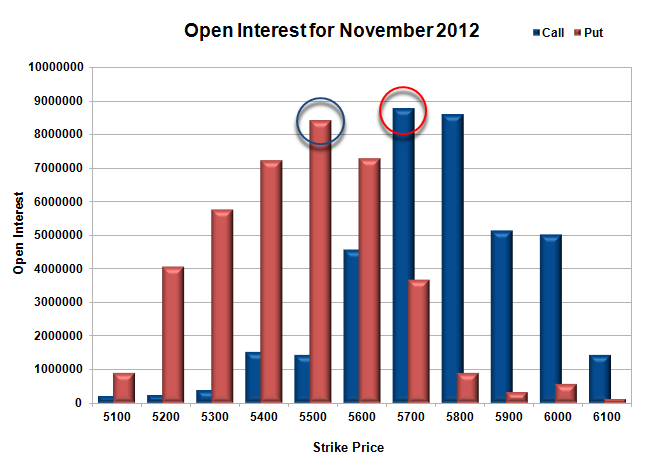 Put Option 6200-5600 added 57.84 lacs huge amount of OI with some more addition seen at 5400 strike price. Highest accumulation on Call option 6000 at 60.3 lacs whereas Put option 5600 at 49.1 lacs & 5700 at 47.6 lacs. Nifty Open Interest is at 1,78,86,150 up by huge 72,21,750, with huge increase in price, most probably huge long build-up. Bank Nifty Open Interest is at 12,69,325 up by huge 6,48,550, with huge increase in price, most probably huge long build-up. FII’s bought huge 40.41 lacs of Futures, most probably long build-up, and the average price per contract comes to around 5853. FII’s future open contract as on date is 331495. 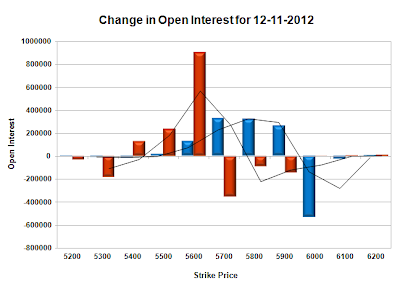 PCR Open Interest (Volume) at start of series is comfortably placed at 1.311. Initial support at 5700, and below that at 5600 with highest OI of 49.1 lacs. Resistance right now at 5900, and above that at 6000 with highest OI in Option Table at 60.3 lacs. Range as per Option Table is 5759 -5849 and as per VIX is 5778 - 5872 with 5790 as the Pivot. Nifty opened up on the back of good global cues, and galloped away above 5700 within the first hour of trade. The index remained strong throughout the full session to close near the highs of the day at 5727.45 a huge gain of 91.55 points. The broader market was positive with 1003 advances to 512 declines. The OI Table saw huge huge unwinding in most of the CE levels. Call option 5800 added 7.22 lacs huge amount of OI with huge short covering seen at 5700 and below strike prices. Put Option 5800-5700 added 35.33 lacs huge amount of OI with profit booking seen at 5600 and below strike prices. Highest accumulation on Call option 5800 at 89.2 lacs whereas Put option 5600 at 84.8 lacs & 5500 at 74.7 lacs. Nifty Open Interest is at 93,78,700 down by 21,24,350, whereas Dec Series saw addition of 54.84 lacs with huge increase in price, most probably 100% rollover with huge long build-up. Bank Nifty Open Interest is at 8,33,825 down by 1,97,975, whereas Dec Series saw addition of 4.05 lacs with increase in price, most probably 100% rollover with huge long build-up. FII’s bought huge 24.28 lacs of Futures, most probably long build-up, as their net OI also increased by 47.74 lacs and their average price per contract comes to around 5246. FII’s future open contract as on date is 467510. PCR Open Interest (Volume) increased above Bull level to 1.349 due to huge addition at 5700PE and reduction at 5700CE level. 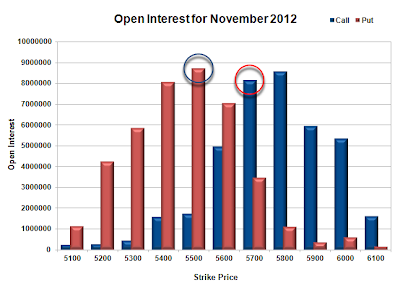 Initial support for expiry now at 5700, and below that at 5600 with highest OI of 84.8 lacs. 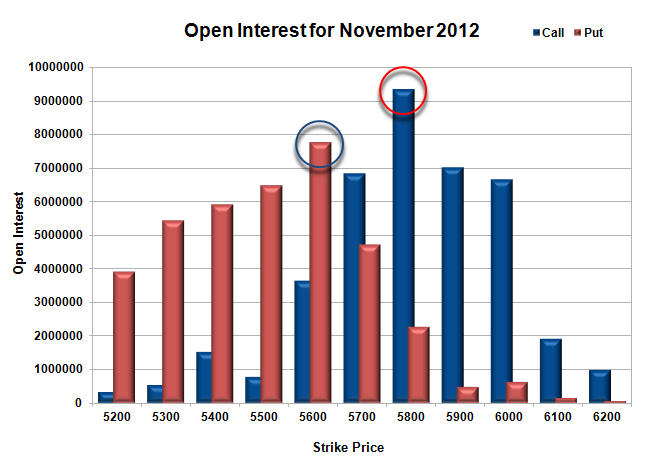 Resistance now at 5800, with highest OI in Option Table at 89.2 lacs. Range as per Option Table is 5668 -5753 and as per VIX is 5686 - 5769 with 5690 as the Pivot. Nifty opened up on the back of good global cues, but seems like the gap-ups are used to sell, and Nifty saw the lows of the day around 5620 within the first 2 hours of trade. Buying was seen around the lows, and it turned out to be a flat day with the index closing at 5635.90 a small gain of 9.30 points. The broader market was positive with 870 advances to 621 declines. The OI Table saw huge huge unwinding in most of the CE levels. Call option 5600 and below covered huge amount of OI with huge profit booking seen at 5800 and above strike prices. Put Option 5800-5600 added 15.52 lacs huge amount of OI with profit booking seen at 5400 and below strike prices. 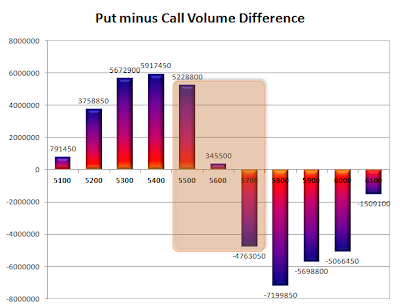 Highest accumulation on Call option 5700 at 86.8 lacs & 5800 at 82.0 lacs whereas Put option 5500 at 86.7 lacs & 5600 at 85.4 lacs. Nifty Open Interest is at 1,15,03,050 down by 12,57,800, whereas Dec Series saw addition of 18.27 lacs with small increase in price, most probably 100% rollover with some long build-up. Bank Nifty Open Interest is at 10,31,800 down by 59,600, whereas Dec Series saw addition of 0.33 lacs with decrease in price, most probably 55% rollover with some long liquidation. FII’s bought huge 2.95 lacs of Futures, most probably long build-up, as their net OI also increased by 8.46 lacs and their average price per contract comes to around 5033. FII’s future open contract as on date is 372023. PCR Open Interest (Volume) increased to 1.10 due to huge liquidation at all CE levels. Support at 5600 got stronger with huge addition of 12.4 lacs OI for the day, and below that at 5500 with highest OI of 86.7 lacs. 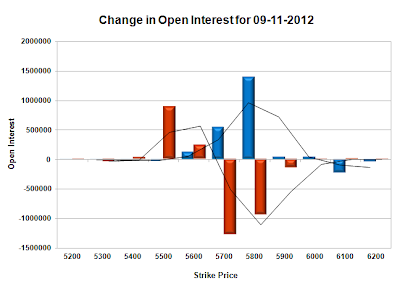 Resistance still very much at 5700, with highest OI of 86.8 lacs, and above that at 5800 with OI of 82.0 lacs. 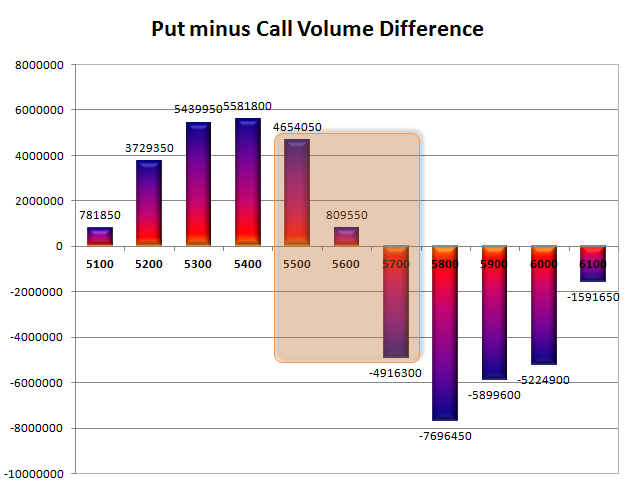 Range as per Option Table is 5595 -5677 and as per VIX is 5593 - 5679 with 5630 as the Pivot. Nifty opened flat and after around 2 hours of dull trade moved down below 5600 level, but the responsive buyers took control and moved the index above the previous day’s close. The index ultimately closed flat at 5626.60 a miniscule loss of 1.15 points. The broader market was weak with 647 advances to 841 declines. The OI Table saw huge profit booking at 5600-5500 PE levels. Call option 5700 added 6.60 lacs of OI with huge short covering seen at 5600 and below strike prices. Put Option 5700 and above covered huge amount of OI with huge profit booking seen at 5600 and below strike prices. 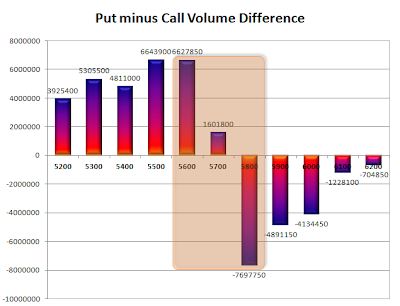 Highest accumulation on Call option 5700 at 87.7 lacs & 5800 at 86.0 lacs whereas Put option 5500 at 84.2 lacs & 5600 at 73.0 lacs. Nifty Open Interest is at 1,27,60,850 down by 6,46,050, whereas Dec Series saw addition of 4.89 lacs with not much change in price, mostly rollover with some long liquidation. Bank Nifty Open Interest is at 10,91,400 down by 47,175, whereas Dec Series saw addition of 0.16 lacs with decrease in price, mostly some rollover with long liquidation. FII’s bought small 0.39 lacs of Futures, most probably long build-up, as their net OI also increased by 3.32 lacs and their average price per contract comes to around 4990. FII’s future open contract as on date is 355103. 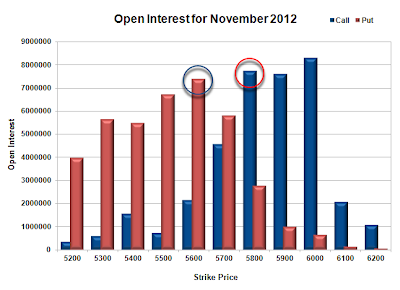 PCR Open Interest (Volume) decreased due to huge profit booking seen at 5600 and 5500 strike prices and now at 1.034. 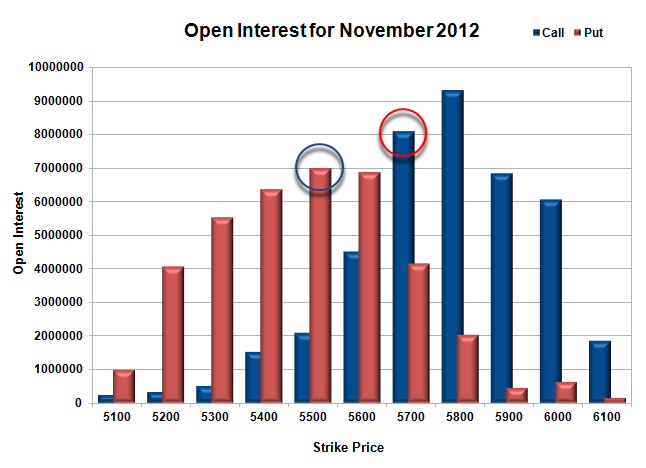 Initial support now at 5600 with huge OI of 73.0 lacs, and below that at 5500 with highest OI of 84.2 lacs. 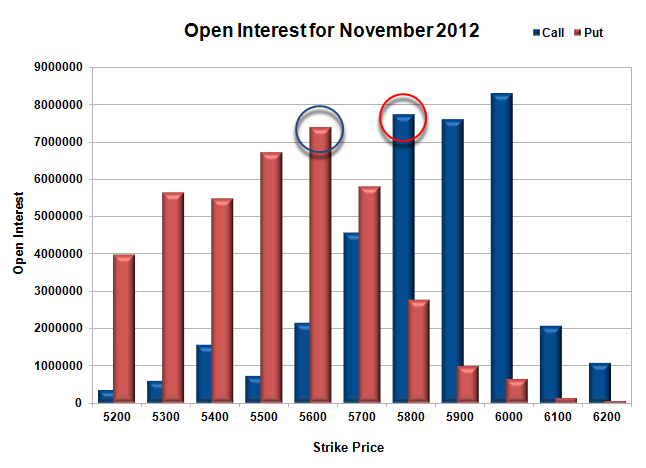 Huge Resistance 5700, with highest OI in Option Table at 87.7 lacs, and above that at 5800 with OI of 86.0 lacs. Range as per Option Table is 5578 -5667 and as per VIX is 5583 - 5670 with 5625 as the Pivot. Nifty opened positive and immediately moved towards 5640 to be sold off to the lows of the day around 5610, where bargain hunters moved in to again moved the index to the highs of the day but closed well off at 5627.75 a small gain of 12.95 points. The broader market was just positive with 787 advances to 703 declines. The OI Table saw the support back at 5600 with huge addition for the day at 11.8 lacs. Call option 5800 only added 0.40 lacs of OI with huge short covering seen at 5600 and below strike prices. Put Option 5700-5500 added 21.03 lacs huge amount of OI with huge profit booking seen at 5400 and below strike prices. Highest accumulation on Call option 5800 at 86.2 lacs & 5700 at 81.1 lacs whereas Put option 5500 at 91.5 lacs & 5600 at 82.2 lacs. Nifty Open Interest is at 1,34,06,900 down by 5,03,850, whereas Dec Series saw addition of 6.41 lacs with increase in price, 100% rollover with some long build-up in next series. Bank Nifty Open Interest is at 11,38,575 up by 47,925, whereas Dec Series saw addition of 0.39 lacs with increase in price, most probably long build-up in both series. FII’s sold small 0.52 lacs of Futures, most probably short build-up, as their net OI also increased by 6.48 lacs and their average price per contract comes to around 4983. FII’s future open contract as on date is 348473. PCR Open Interest (Volume) has got a new lease of life and now at 1.080. Support has moved up and now at 5600 with huge addition for the day at 11.8 lacs and OI now 82.2 lacs, and below that at 5500 with highest OI of 91.5 lacs. Resistance still very much at 5700, though saw another round of liquidation but OI still above 81 lacs, and above that at 5800 with highest OI of 86.2 lacs. 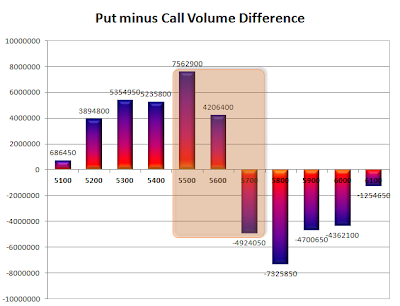 Range as per Option Table is 5583 -5670 and as per VIX is 5584 - 5672 with 5615 as the Pivot. Nifty opened flat to positive and after the initial dip towards 5560, the responsive buyers took control of the situation and moved the index above 5600 to close near the day’s high at 5614.80 a cool gain of 43.25 points. The broader market performed much better from the previous few days with 769 advances to 726 declines. 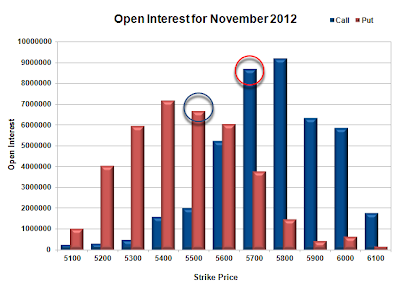 The OI Table got a fresh lease of life, with bulls coming back with huge addition at 5500-5600PE levels. Call option 5800 only added 2.52 lacs huge amount of OI with huge short covering seen at 5600 and below strike prices. Put Option 5600-5400 added 35.1 lacs huge amount of OI with small profit booking seen at 5300 strike price. 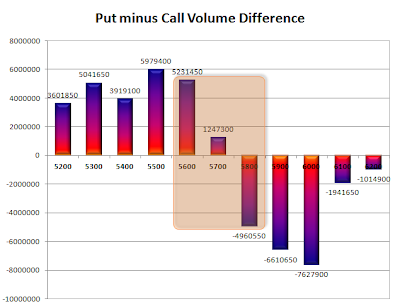 Highest accumulation on Call option 5800 at 85.8 lacs & 5700 at 81.4 lacs whereas Put option 5500 at 87.2 lacs & 5400 at 80.5 lacs. 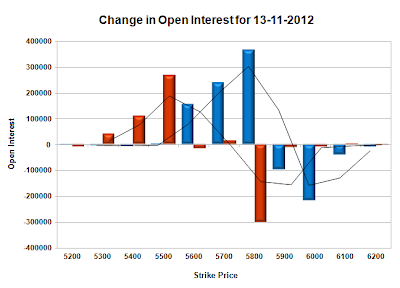 Nifty Open Interest is at 1,39,10,750 down by 1,61,050 with increase in price, most probably short covering. 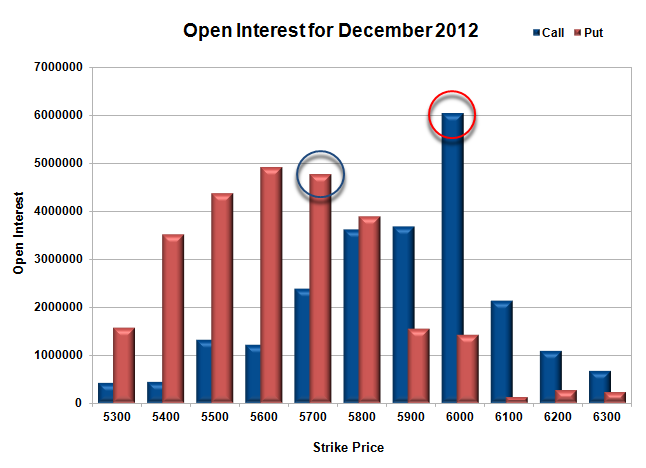 Bank Nifty Open Interest is at 10,90,650 up by 65,750 with increase in price, most probably long build-up. FII’s sold small 1.09 lacs of Futures, most probably short build-up, as their net OI also increased by 6.63 lacs and their average price per contract comes to around 4933. FII’s future open contract as on date is 335520. 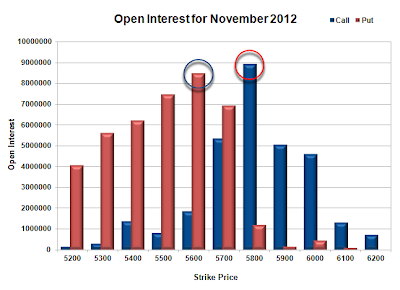 PCR Open Interest (Volume) has jumped above 1 on the back of huge addition at 5500-5600PE levels and now at 1.029. Best support at 5500 with highest OI in the Option Table at 87.2 lacs, and below that at 5400 with OI of 80.5 lacs. 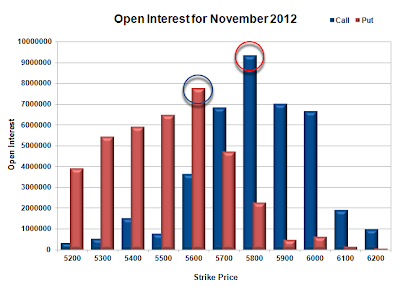 Resistance still very much at 5700, though saw some liquidation, and above that at 5800 with highest OI of 85.8 lacs. Range as per Option Table is 5558 -5650 and as per VIX is 5569 - 5660 with 5605 as the Pivot. Nifty opened in the positive above 5600 level on the back of good global cues but was immediately sold off. Nifty went on to make a low around 5550 and a small pullback towards the end saw the index close flat at 5571.55, a minute gain of 0.15 points. The broader market under performed the index at 430 advances to 1066 declines. 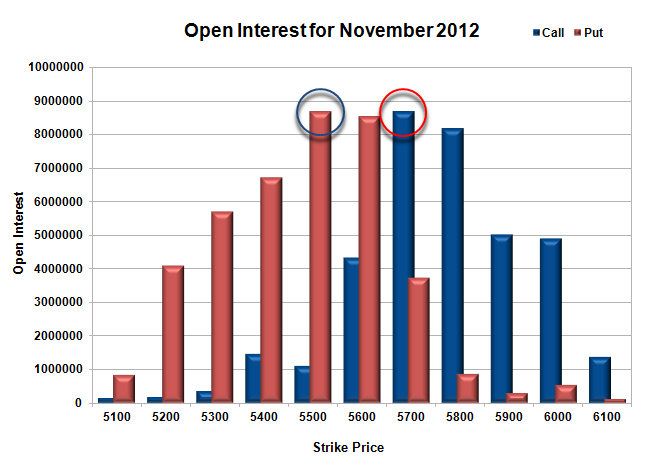 The OI Table saw huge profit booking by the CE writers at 5700 and above strike prices. Call option 5600 added 2.09 lacs huge amount of OI with huge profit booking seen at 5700 and above strike prices. Put Option 5500-5300 added 8.84 lacs huge amount of OI with huge short covering seen at 5600 and above strike prices. 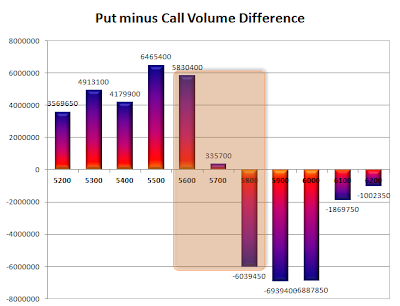 Highest accumulation on Call option 5800 at 83.3 lacs & 5700 at 82.7 lacs whereas Put option 5400 at 75.2 lacs & 5500 at 69.9 lacs. Nifty Open Interest is at 1,40,71,800 down by 6,68,800 with no change in price, most probably long liquidation/short covering. Bank Nifty Open Interest is at 10,24,900 down by 70,550 with not much change in price, most probably long liquidation/short covering. FII’s bought huge 5.29 lacs of Futures, most probably short covering, as their net OI also decreased by 4.55 lacs and their average price per contract comes to around 4856. FII’s future open contract as on date is 322262. 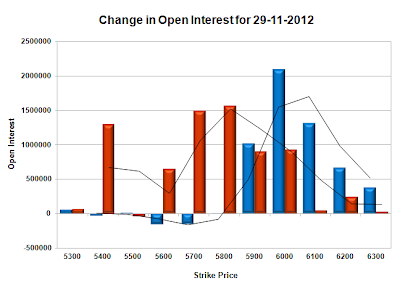 PCR Open Interest (Volume) after many days increased a bit to 0.923. 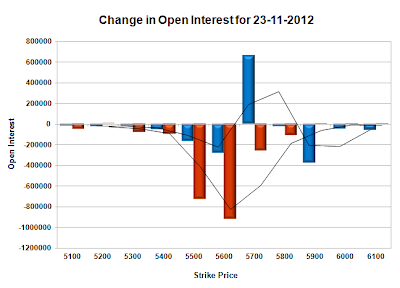 Support got better at 5500 with OI above 69.9 lacs, and below that at 5400 with OI of 75.2 lacs. 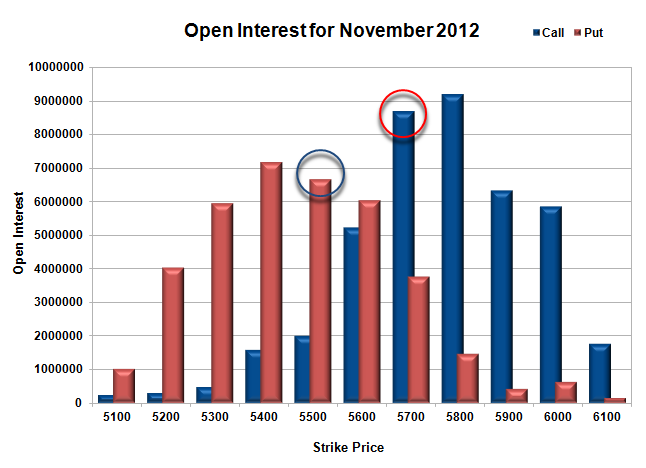 Resistance still very much at 5700, though saw some liquidation, and above that at 5800 with highest OI of 83.3 lacs. Range as per Option Table is 5533 -5622 and as per VIX is 5525 - 5618 with 5590 as the Pivot. Nifty opened flat and tried to move above 5600 in the initial hours of trade, but got sold off below the previous day’s close. The index tried to move above the dotted line but closed just below it at 5574.05, a minuscule loss of 2.65 points. The broader market was very weak at 449 advances to 1052 declines. 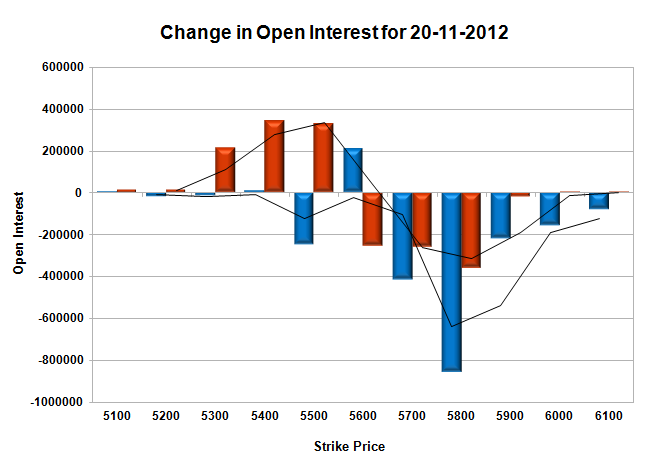 The OI Table is looking extremely weak for the Bulls with huge liquidation at 5500 and above strike prices. Call option 5600-5700 added 13.04 lacs huge amount of OI with some profit booking seen at 5800 and above strike prices. Put Option 5400-5300 added 12.11 lacs huge amount of OI with huge short covering seen at 5600 and above strike prices. 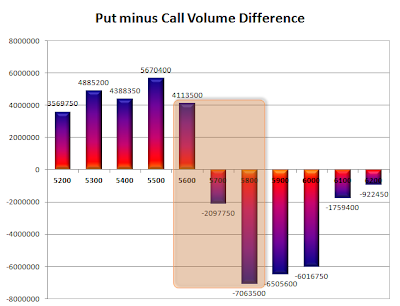 Highest accumulation on Call option 5800 at 91.8 lacs & 5700 at 86.8 lacs whereas Put option 5400 at 71.8 lacs & 5500 at 66.7 lacs. 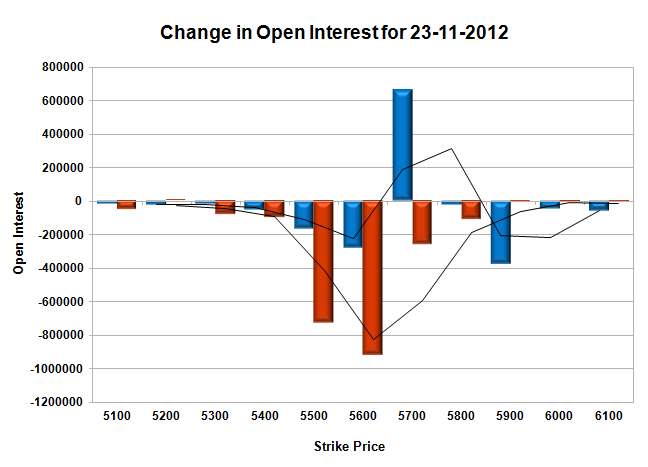 Nifty Open Interest is at 1,47,40,600 down by 2,97,500 with small decrease in price, most probably long liquidation. Bank Nifty Open Interest is at 10,95,450 down by 61,475 with decrease in price, most probably long liquidation. FII’s sold small 0.58 lacs of Futures, most probably long liquidation, as their net OI also decreased by 3.35 lacs and their average price per contract comes to around 4869. FII’s future open contract as on date is 331356. PCR Open Interest (Volume) is down again and now at 0.886. 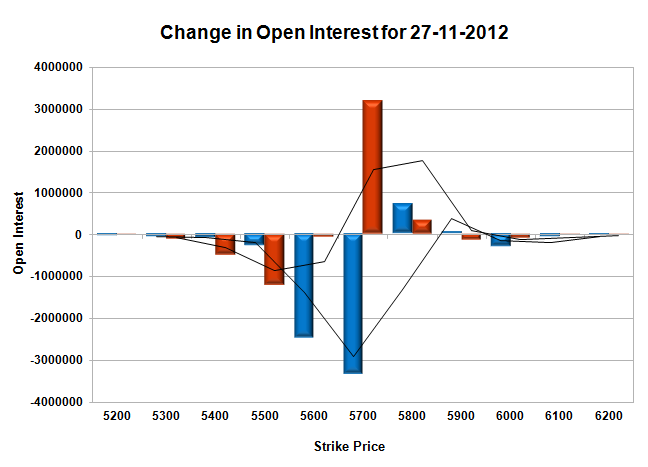 Support still at 5500 with huge OI of 66.7 lacs, and below that at 5400 with OI of 71.8 lacs. Huge resistance right now at 5700, with OI above 86.8 lacs, and above that at 5800 with highest OI of 91.8 lacs. 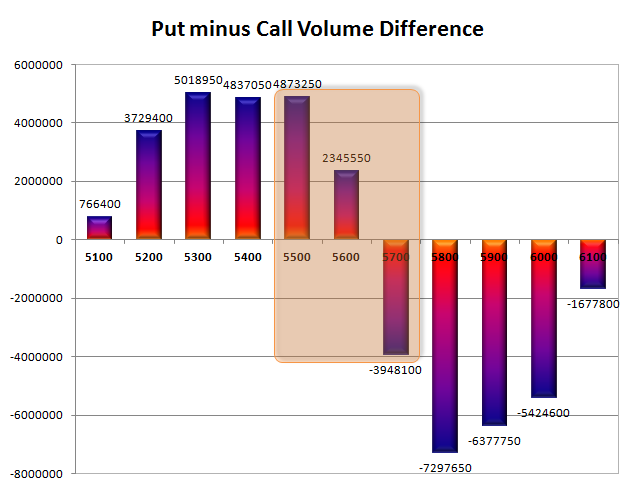 Range as per Option Table is 5528 -5617 and as per VIX is 5523 - 5620 with 5590 as the Pivot. Nifty opened flat and what looked like a normal range bound day, turned out to be a nightmare for the bulls with huge liquidation in Nifty saw the index close at the lowest point of the day at 5574.05, a huge loss of 56.95 points. The broader market was also very weak with 483 advances to 1021 declines. The OI Table saw huge addition at 5500-5700 CE levels and now 5700 would be the level to scale for the Bulls to get back in the game. Call option 5500-5700 added 34.41 lacs huge amount of OI with some profit booking seen at 5900 and above strike prices. Put Option 5500-5100 added 12.46 lacs huge amount of OI with huge short covering seen at 5600 and above strike prices. Highest accumulation on Call option 5800 at 93.3 lacs & 5700 at 80.9 lacs whereas Put option 5500 at 69.8 lacs & 5600 at 68.7 lacs. 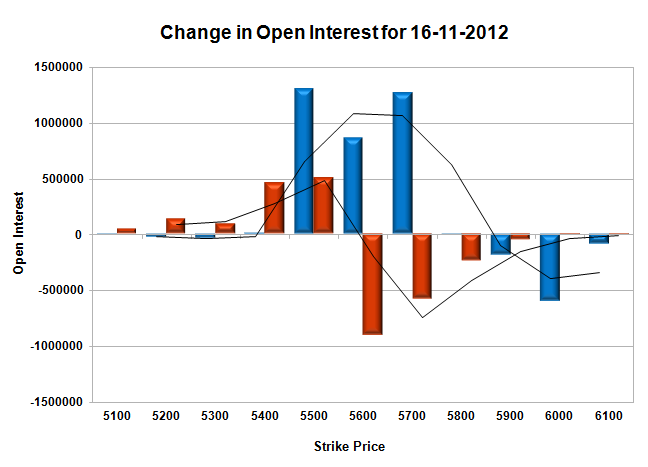 Nifty Open Interest is at 1,50,38,100 down by 19,18,450 with decrease in price, most probably huge long liquidation. Bank Nifty Open Interest is at 11,56,925 down by 48,625 with decrease in price, most probably long liquidation. FII’s sold HUGE 13.77 lacs of Futures, most probably long liquidation, as their net OI also decreased by 15.36 lacs and their average price per contract comes to around 4856. FII’s future open contract as on date is 338053. PCR Open Interest (Volume) is very weak and now at 0.911. Support is down to 5500 with huge OI of 69.8 lacs, and below that at 5400 with OI of 63.7 lacs. Huge resistance right now at 5700, with OI above 80.9 lacs, and above that at 5800 with highest OI of 93.3 lacs. Range as per Option Table is 5545 -5634 and as per VIX is 5527 - 5621 with 5600 as the Pivot. Nifty opened weak on the back of weak global cues and went on to touch the lows of 5600. A small pullback towards the end, saw the index close at 5631, still a good loss of 35.95 points. The broader market was also weak with 542 advances to 981 declines. The OI Table is truly in the hands of the Bears with huge addition for the day from 5600-5800CE levels. Call option 5600-5800 added 38.18 lacs huge amount of OI with some profit booking seen at 5900 and above strike prices. 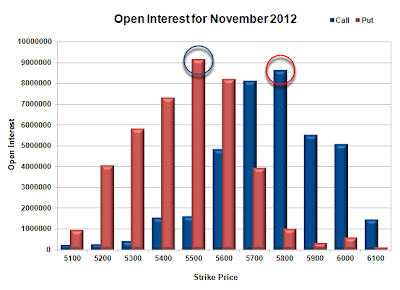 Put Option 5400 added 1.75 lacs huge amount of OI with huge short covering seen at 5600 and above strike prices. Highest accumulation on Call option 5800 at 93.4 lacs & 5900 at 70.1 lacs whereas Put option 5600 at 77.7 lacs & 5500 at 64.7 lacs. Nifty Open Interest is at 1,69,56,550 down by 13,86,100 with decrease in price, most probably huge long liquidation. Bank Nifty Open Interest is at 12,05,550 down by 73,355 with not much change in price, most probably long liquidation. FII’s sold HUGE 24.31 lacs of Futures, most probably long liquidation, as their net OI also decreased by 30.45 lacs and their average price per contract comes to around 4971. FII’s future open contract as on date is 368768. 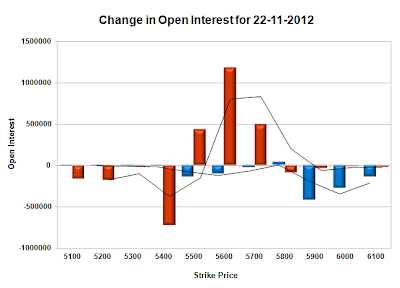 PCR Open Interest (Volume) went down below 1 and now at 0.974. Support at 5600 is starting to look weak with huge liquidation for the day at 5.08 lacs, and below that at 5500 with OI of 64.7 lacs. Initial resistance right now at 5700, with huge addition for the day at 16.9 lacs and above that at 5800 with highest OI of 93.4 lacs. Range as per Option Table is 5587 -5673 and as per VIX is 5585 - 5677 with 5670 as the Pivot. Mahurat trading saw the index open flat, but started selling off from the word go to close around the lows of the day at 5666.95 a small loss of 16.75 points. The broader market performed better with 1011 advances to 430 declines. The OI Table saw addition mainly at 5700-5800CE for the day. 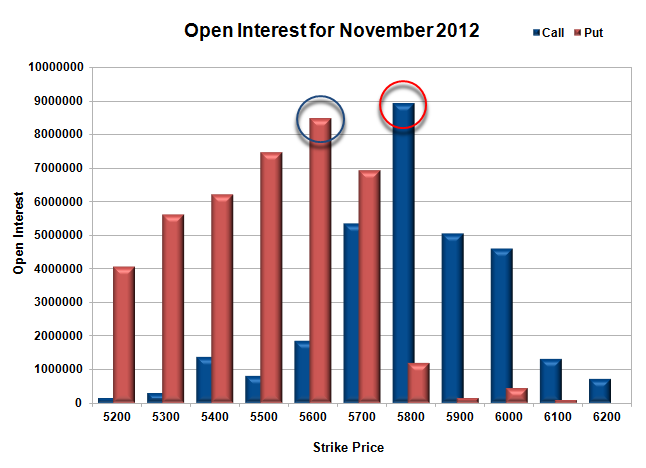 Call option 5600-5800 added 7.63 lacs huge amount of OI with some profit booking seen at 5900 and above strike prices. 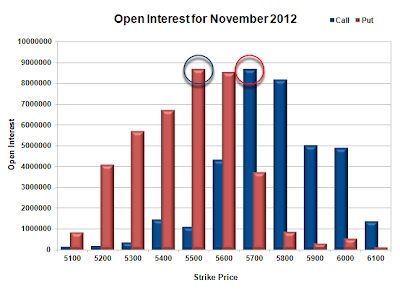 Put Option 5500-5300 added 4.21 lacs huge amount of OI with huge short covering seen at 5800 and above strike prices. 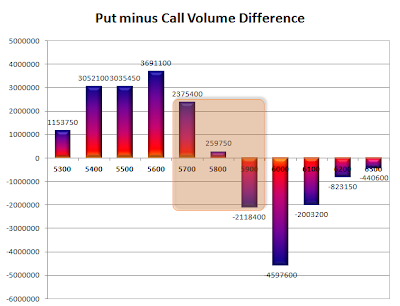 Highest accumulation on Call option 5800 at 84.2 lacs & 5900 at 77.8 lacs whereas Put option 5600 at 82.7 lacs & 5500 at 72.3 lacs. 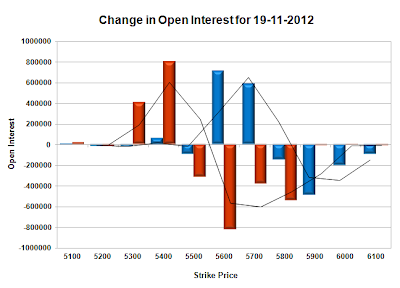 Nifty Open Interest is at 1,83,42,650 down by 1,10,950 with small decrease in price, most probably long liquidation. Bank Nifty Open Interest is at 12,78,900 down by 31,175 with decrease in price, most probably long liquidation. FII’s bought small 0.85 lacs of Futures, most probably long build-up, as their net OI also increased by 3.63 lacs and their average price per contract comes to around 5015. FII’s future open contract as on date is 429673. PCR Open Interest (Volume) is going down with each passing day and now at 1.076. 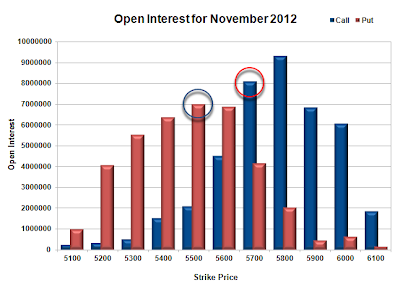 Support still at 5600, though covered some OI, and below that at 5500 with OI of 72.3 lacs. 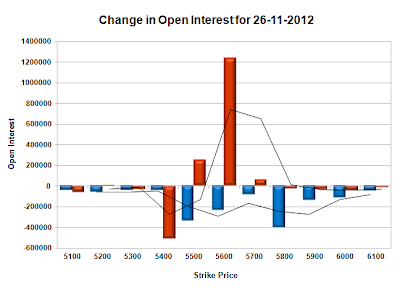 Huge Resistance at 5800, with highest OI of 84.2 lacs and above that at 5900 with OI above 77.8 lacs. Range as per Option Table is 5631 -5718 and as per VIX is 5623 - 5711 with 5690 as the Pivot. Nifty opened on a positive note, but September IIP data at negative 0.4% came as a shocker for the market and the index drifted down to the lows of the day around 5665. Bargain hunting saw the index close at 5683.70 a miniscule loss of 2.55 points. 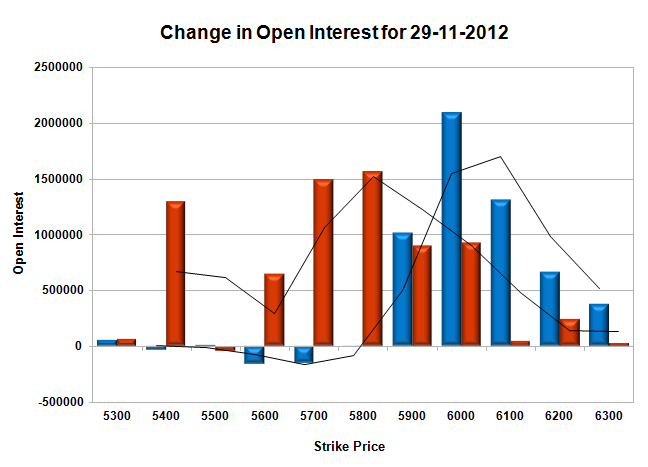 The OI Table for the day saw 5800CE and 5600PE OI moving above 80 lacs. Call option 5600-5900 added 10.48 lacs huge amount of OI with some profit booking seen at 6000 and above strike prices. Put Option 5600-5400 added 12.69 lacs huge amount of OI with huge short covering seen at 5700 and above strike prices. Highest accumulation on Call option 5800 at 80.5 lacs & 5900 at 78.7 lacs whereas Put option 5600 at 82.9 lacs & 5500 at 69.6 lacs. 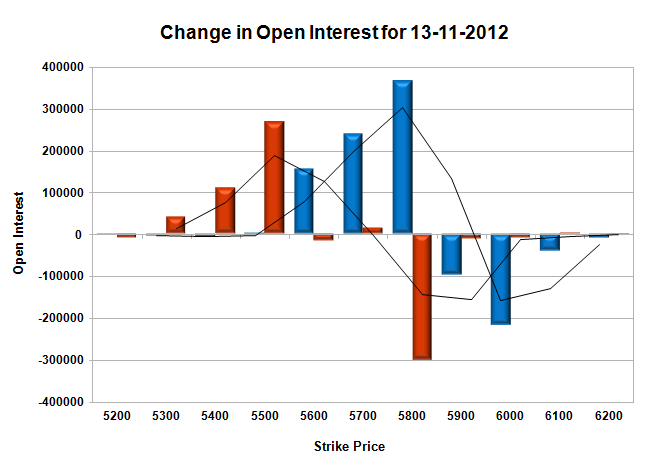 Nifty Open Interest is at 1,84,53,600 down by 4,51,200 with small decrease in price, most probably long liquidation. 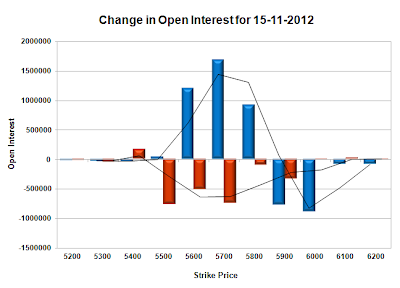 Bank Nifty Open Interest is at 13,10,075 up by 64,150 with increase in price, most probably huge long build-up. FII’s sold huge 7.79 lacs of Futures, most probably long liquidation, as their net OI also decreased by 8.69 lacs and their average price per contract comes to around 5036. FII’s future open contract as on date is 422405. PCR Open Interest (Volume) is still hovering at 1.086. Support at 5600 is getting better with each passing day and now has the highest OI in the Option Table at 82.9 lacs, and below that at 5500 with OI of 69.6 lacs. 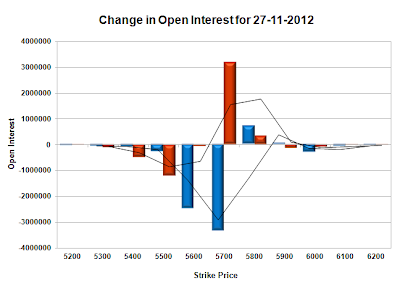 Huge Resistance at 5800, with OI of 80.5 lacs and above that at 5900 with OI above 78.7 lacs. 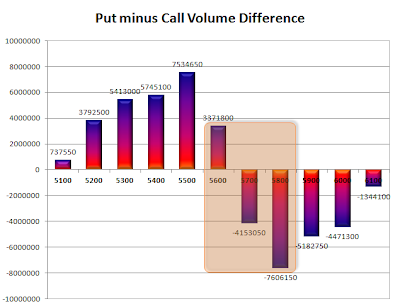 Range as per Option Table is 5645 -5734 and as per VIX is 5639 - 5728 with 5700 as the Pivot. Nifty opened flat, but drifted down with each passing hour to end at the day’s low at 5686.25, with not a semblance of any pull back. The index lost 52.50 points or around 0.91% and for the week it was down by 0.2%. The OI Table right now is tilted towards the Bears with huge OI from 5800-6000 CE levels. 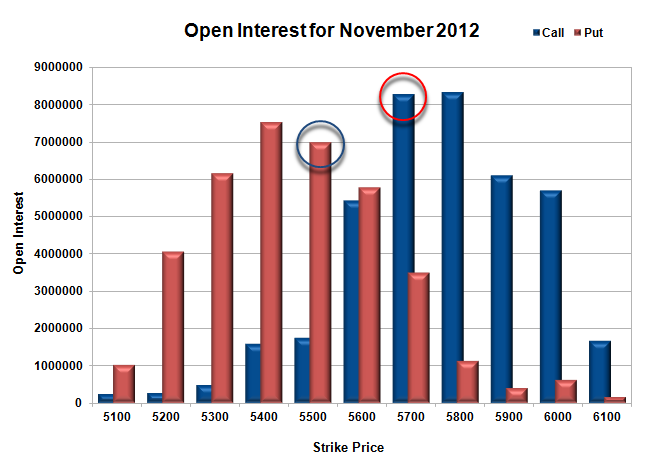 Call option 5600-6000 added 21.6 lacs huge amount of OI with some profit booking seen at 6100 and above strike prices. Put Option 5600-5400 added 11.7 lacs huge amount of OI with huge short covering seen at 5700 and above strike prices. Highest accumulation on Call option 6000 at 83 lacs & 5800 at 77.3 lacs whereas Put option 5600 at 73.9 lacs & 5500 at 67.2 lacs. Nifty Open Interest is at 1,89,04,800 down by 30,350 with huge decrease in price, most probably short build-up. 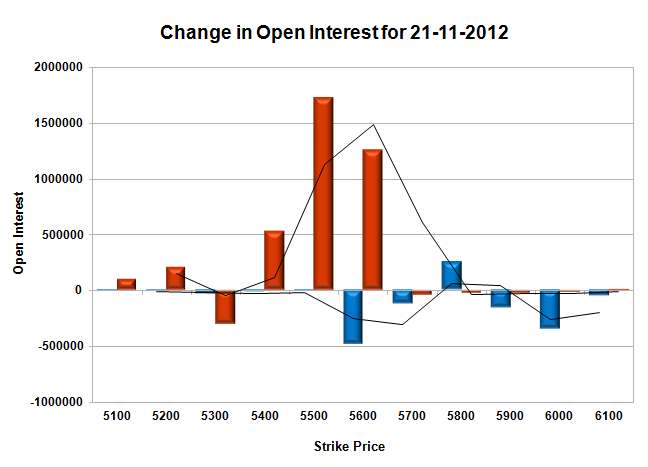 Bank Nifty Open Interest is at 12,45,925 down by 76,775 with decrease in price, most probably huge long liquidation. FII’s sold huge 5.66 lacs of Futures, most probably long liquidation/short build-up, as their net OI decreased by 1.51 lacs and their average price per contract comes to around 5051. FII’s future open contract as on date is 439783. PCR Open Interest (Volume) is just above 1 at 1.086. Best support at 5600, with highest OI of 73.9 lacs and below that at 5500 with OI of 67.2 lacs. Resistance at 5800, with huge addition for the day of 13.9 lacs and above that at 5900 with OI above 76 lacs. 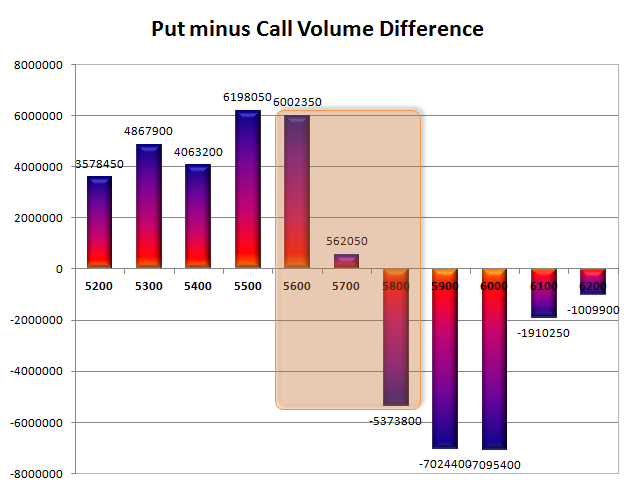 Range as per Option Table is 5655 -5744 and as per VIX is 5643 - 5729 with 5700 as the Pivot.